The people, places and things that make Dublin special. When Justin Timberlake’s parents were there, where was Justin? This is a legitimate question when you look up at the Leo Burdock‘s Hall Of Fame. Justin’s parents are listed on the wall, while he himself is notably absent. 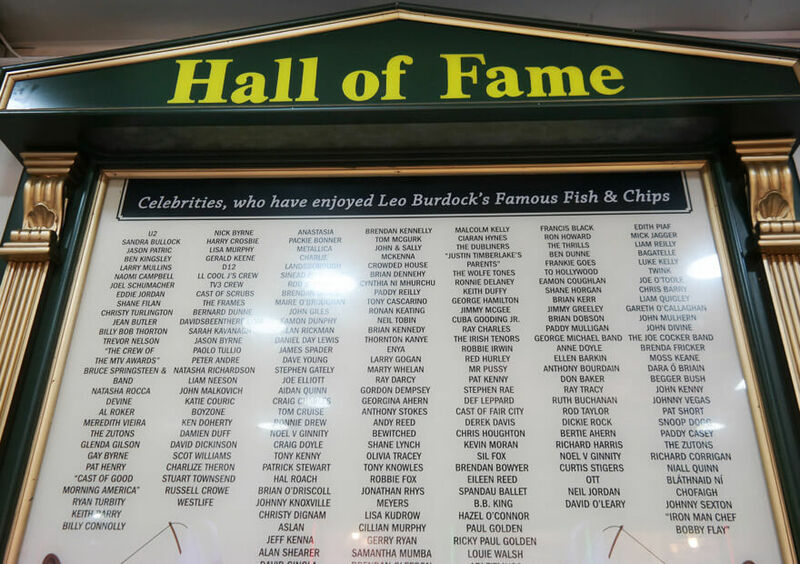 The chipper is renowned for pulling in big names and listing them proudly on its wall. Spandau Ballet, Ray Charles, Ben Kinsley, even Edith Piaf. A possible supergroup? Bruce Springsteen was there just a few months ago. 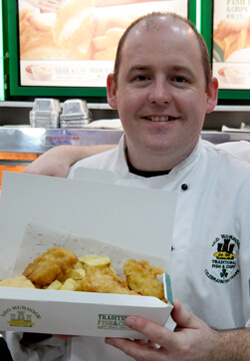 And he’s been before – the Boss is known for his love of fish and chips. They pull in other names too. Local ones, maybe less well known, who come time and time again. Open up the bag, and let out that quintessential chip smell. You hurriedly blow on the contents inside to hasten the cooling process. No, you’re going to have to wait. But the sooner you do that, the sooner you can feast on the goodness inside. There’s those seriously crispy, golden chips that are oh so soft in the middle. And not forgetting those strips of fresh fish in that glorious batter. Leo Burdocks is Leo Burdocks. The chipper is known the city over. It’s just one of those things in Dublin, like a piece of furniture that’s always been there. You don’t remember the first time seeing it because it’s always been a fixture. But what is it about the place? How’s it been there so long? Dublin.ie is on the case. We’ve got Darren Salmon on hand to help us. A good name to have in a chipper, he quips. Mr. Salmon, has been there for 22 years. He began as a runner, bringing the potatoes up the hill to the original Leo Burdocks here at Christchurch on Werburgh Street. He’s worked in some of the other Burdocks chippers too, but he’s been manager at Christchurch for the last 8 years. Dubs will always have their chipper preference, but Leo Burdocks is quite a name. Do they feel any pressure? “It’s a big name to behold”, says Salmon. Leo Burdocks first opened its doors in 1913. It’s older than the state. There’s been revolution, a civil war, two world wars. During the second one it had to close its doors due to shortages, but they reopened soon after. Governments have come and gone. It’s seen recession, boom, and bust, and they’re still there serving those all important fish and chips. Darren’s years as a runner brings up the subject of the hill they’re planted on. Walking up the hill’s steep sides from either Dame Street or Werburgh Street, you almost have to earn your fish and chips. A minor workout. A pilgrimage of sorts. There’s St. Patrick’s Park just at the bottom. The perfect place to enjoy an impromptu meal al fresco on a sunny day. Or you could even venture to the Wood Quay amphitheatre. Because it’s not just about the fish and chips, it’s how you enjoy them and where. And there’s quite a few spots nearby that will enhance your experience. Christchurch is one of the oldest parts of the city. You’ve even got the remains of the original Viking settlement just down on the quays. It’s really the ideal place to have the city’s oldest chipper. And not much has changed in what they do. Technologically speaking, they had one of last coal fire pans in the British Isles, Darren tells us, but now they use gas. They’re serious when they say not much has really changed. Something we didn’t know about Leo Burdocks? “If I told you, I’d have to kill you” chimes Darren with a sly laugh. But in earnest that’s it, there are no secrets. After one hundred and three years we know what we’re getting. We know what we’re ordering. We know what to expect – just like the Boss. Burdock’s now has seven locations across the county of Dublin. See leoburdock.com for more. A series of colourful traffic signal boxes has added art to the streets of Dublin city as part of the Dublin Canvas project. It’s probably the first time most of us have even noticed these boxes; their old dull appearance was nothing to admire. Now works of art, they showcase the artistic talents of people across Dublin. Dublin Canvas is a community street art project, its main goal to make the city more beautiful, and it has definitely achieved it. David Murtagh, the project coordinator has given us some background on the project. Dublin.ie: When did the project start? David: The project started in 2013.